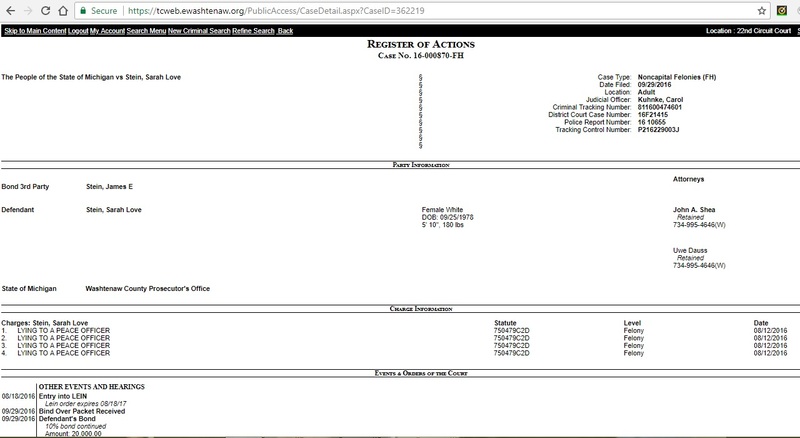 Carol Kuhnke, the judge who in November of 2016 was busted for illegal possession of drugs, filed as incumbent in the election(s) that will occur later this year. This judge intends to persuade people that five and a half years of her judicial ineptitude aren't enough. Carol Kuhnke is adamant that if there's a spot in court that even a corrupt judge could hold, it has to be her. Back in year 2012 Carol Kuhnke was just a populist candidate playing the celebrity card of being openly gay. By year 2018, incumbent Carol Kuhnke has repeatedly embarrassed herself through her notorious history of incompetence, misconduct, and miscarriage of justice in civil as well as criminal cases. Worrisome signs of her delusion in social networks don't help her either. The bulk of Carol Kuhnke's features makes it easy for any decent candidate to leverage the electorate's once-in-six-years opportunity to fire her from the bench. 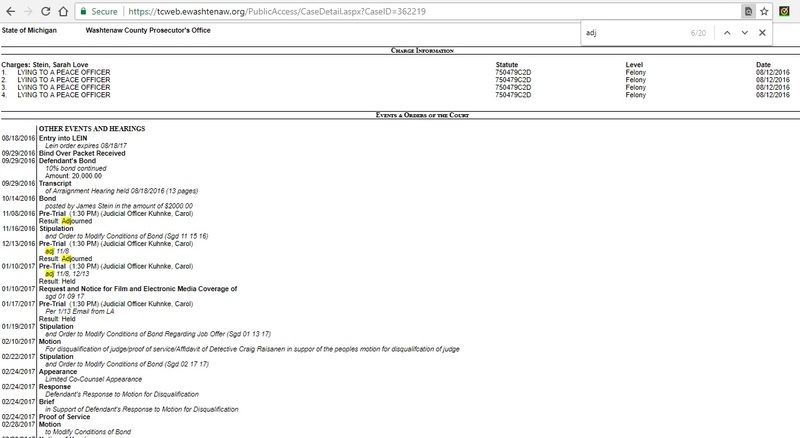 In that sense, Carol Kuhnke's judicial office can be considered as vacant as when a judge's retirement is imminent. But serious non-incumbents need to file before April 24 to make this happen, because also in a democracy it is true that when scumbag is the only option on the ballots, scumbag takes all. Judge Felon Kuhnke or felon judge Kuhnke (the order of the factors does not alter the product) gained shameful notoriety when Detective Raisanen discovered that Carol Kuhnke knowingly possessed narcotics that were neither prescribed to her nor to any person from her household. MCL 333.7403 makes it a felony to knowingly and intentionally possess a controlled substance that is not prescribed to that person. Relevant excerpts of the police report are available here. 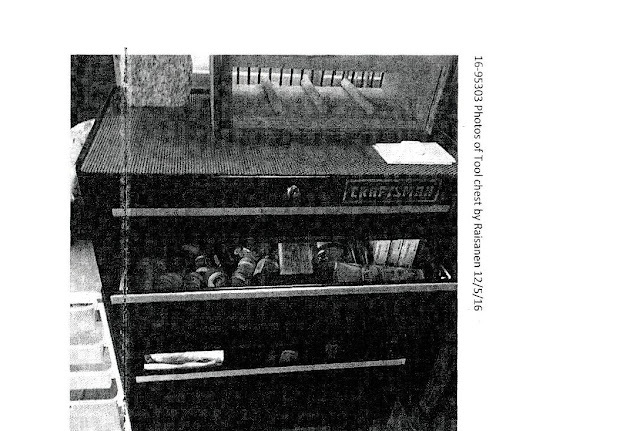 A copy of the full report can be found as exhibit in the motions for disqualification in cases 16-870-FH and 16-945-FC in the Washtenaw County Trial Court (provided this judge hasn't made these files disappear), although printing this gem of judge's misconduct costs $2 per page. The detective's findings earned Carol Kuhnke, J.D., what we may call a certificate of Juris Drugstore: a letter where the special prosecutor who was assigned to this matter certifies to the Michigan Judicial Tenure Commission (JTC) that "the evidence supported the filing of criminal charges for the possession of controlled substances that were not prescribed to her". The prosecutor also wrote a letter to Carol Kuhnke with similar terms. 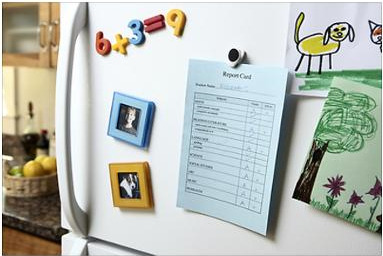 If she puts her mind to it, this ridiculous judge could post that letter on the fridge, just like when mommy and daddy do with the kid's report card. And since Carol Kuhnke supposedly is a grown-up, she gets to decide if she prefers to put it on the tool chest where she used to store liquor and the controlled substance(s) not prescribed to her. Whether on her fridge or her tool chest, a magnet works just fine. 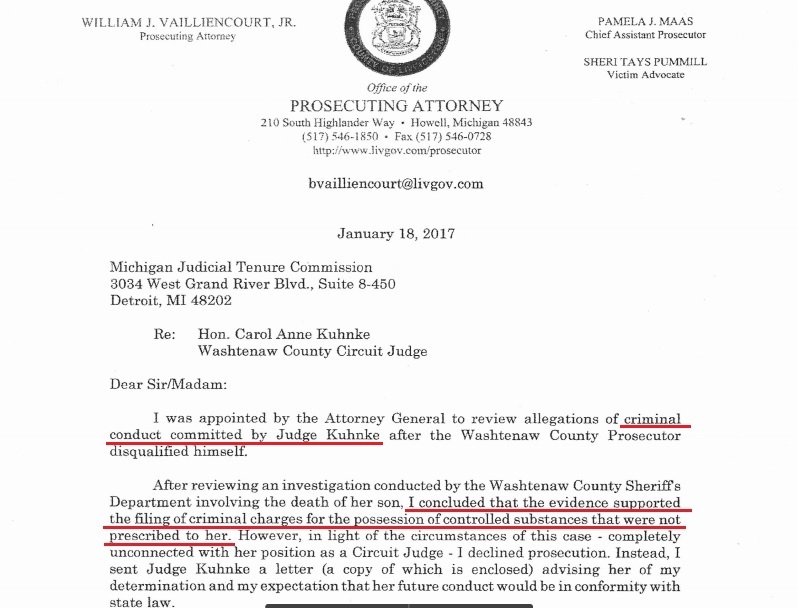 The Washtenaw prosecutor subsequently filed motions asking judge Kuhnke to disqualify herself from both criminal cases 16-870-FH and 16-945-FC, where Detective Raisanen is expected to be a witness. Too arrogant and proud to be fired from cases, judge Kuhnke denied both motions. This judge's sake of presiding these cases despite her drug-related crime reminds us that Carol Kuhnke has no dignity. I dissect the vexatious spirit of judge Kuhnke's excuses in Segment 7 (minute 36:00-41:52) of the series Corrupted from Ed to Judge. With the exception of Joke Carol Kuhnke, everybody else understands the importance of punishing those who lie to a police officer during the investigation of a murder. We who have been victims of a defendant's criminal conduct need the judge to ascertain the truth. Reluctant to do her job, Carol Kuhnke is fond of allowing witnesses to commit perjury and of allowing them to avoid testimony. Now we must thank the defendant to 16-945-FC for pleading guilty. Otherwise we would see Carol Kuhnke juggling also there to do her thing: obstruction of justice, obstruction from the bench. The discovery of Carol Kuhnke's narco-felony unveiled other serious issues that demonstrate her unfitness for judicial office, given her inept decision-making in and out of court. Carol Kuhnke's felony was discovered as a result of her adopted son's drug overdose. John Kuhnke, the adopted son, had been released from rehab for substance abuse just two days earlier (November 23, 2016). The police report reflects that, after depriving John of the company of his cousins on Thanksgiving Day, judge Carol Kuhnke left this teenager completely alone and unsupervised in her apartment so that Carol Kuhnke could go "holiday shopping" on Thanksgiving at 10PM. It appears that erratic Carol Kuhnke "forgot" what she told John just few hours earlier: that she "wanted things to be more low key since he just got out of rehab". In light of John's overdose and his prior access to the drugs and alcohol that Carol Kuhnke stashed in her apartment, this "smart" judge presumed that it's ok to leave John alone and unsupervised if she just locks in a tool chest her liquor and all drugs. The problem is that an approach that works well with pets is a quite stupid idea when applied to a rehab teenager who (1) knows where exactly Carol Kuhnke stashes her liquor and substances, (2) "abuses anything he can get his hands on" (these are judge's words in the police report, not mine), and (3) "has been in and out of residential treatment for most of this year" (same). Compared to animals, a teenager can make a much, so much smarter use of his force, of his hands, and even of tools so as to overcome Carol Kuhnke's petcare mentality. Just because a teenager has been released from rehab two days earlier, it doesn't mean that his sobriety is already consolidated. It is not rocket science that a person battling drug abuse endures for several years a strong temptation to resume his addictions, and that the company of his loved ones can prevent him from relapsing. But instead, this judge ensured that the teenager would have no company and then she left him under the alleged pretext of "holiday shopping" while knowing that a tool chest packed with drugs and liquor was nearby him. Only the devil does that: Devil Carol. 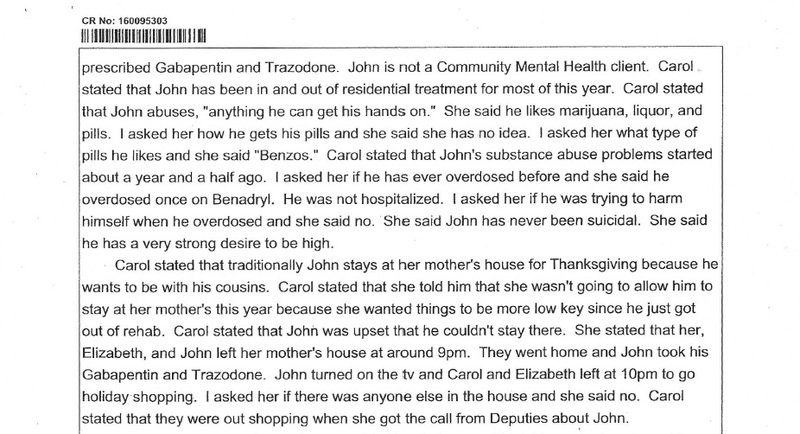 Indeed, John Kuhnke gained access to the alcohol and drugs soon after Carol Kuhnke went to her so-called "holiday shopping", during which John overdosed. At 2:52AM it was tragic that John was not responding to the deputies' efforts to revive him. And it was likewise outrageous that Carol Kuhnke was not responding to the deputies' efforts to contact her. John subsequently died. The several hours of Carol Kuhnke's "low key" holiday shopping must have been a heck of fun. But had this irresponsible judge bothered to check on the vulnerable teenager, or at least to arrange some supervision or company to him (such as the one of which she deprived him hours earlier), John might still be alive. In terms of judge Crumble Kuhnke's low scale of values, today she would not be the criminally busted judge that she is since late 2016. Despite the prosecutor's letter and openness toward the JTC, the latter disregarded the matter. Unfortunately, the JTC takes action only when politics are heavy in the court chambers of Michigan or when judicial misconduct gets wide coverage by the media. Even when the JTC proceeds against a judge, the Michigan Supreme Court is keen on making a drama-circus at hearing without really sanctioning the unfit judge. The latest instance of the Michigan Supreme Circus is the matter of Lisa Gorcyca: a hearing remarkable for the court's tolerance to respondent's blatancy, followed by the court's overly lenient decision. Carol Kuhnke's incompetence in these affairs translates to incompetence on the bench. It is ironic that felon judge Kuhnke remains entrusted with ensuring the victims' safety simply because she hasn't yet been charged and because the JTC ignores the "high standards" to which judges are supposedly held. The police investigation also reflects Carol Kuhnke's domestic involvement with the teenager's mental illness. There is nothing wrong about it, but such involvement makes it improper for Carol Kuhnke to preside cases where one of the parties resorts to the excuse of being mentally ill. When a judge is as obtuse as discussed above, a wrongdoer can manipulate that "compassionate" judge by resorting to pretexts of mental illness. One instance of Kuhnke's judicial bias happened in one of my lawsuits (15-799-CZ), where the defendant (my father's 2nd wife) sometimes resorts to the pretext of her mental illness, other times denies it altogether, but either way she manages to inflict harm to her victims. Given a judge's domestic involvement in a situation of mental illness, a minimum of integrity would prompt that judge to disqualify him-/her-self from cases where a party exploits her own mental illness as a path to impunity. At the very least, a judge with integrity would ask the parties to weigh in on the issue of her disqualification from the case. But Carol Kuhnke does not have that minimum of integrity: She at all times during my litigation concealed from me that "some personal issues" of hers may (and certainly did) impair her ability to adjudge impartially. Carol Kuhnke's intentional concealment in 15-799-CZ only reinforces her awareness of impropriety. While Kuhnke's inept rulings clearly signal her bias, it is pathetic that external evidence of her judicial bias emerges when she is caught with illegal possession of drugs. Can wronged litigants and unsuspecting voters afford to wait till the police renewedly busts Carol Kuhnke for something else that could unveil more of her hidden agenda and corrupt interests? Surely the felon would try being more cautious to avoid getting caught again. Another troubling issue is Carol Kuhnke's double speech. Her inconsistency amounts to having multiple personalities. 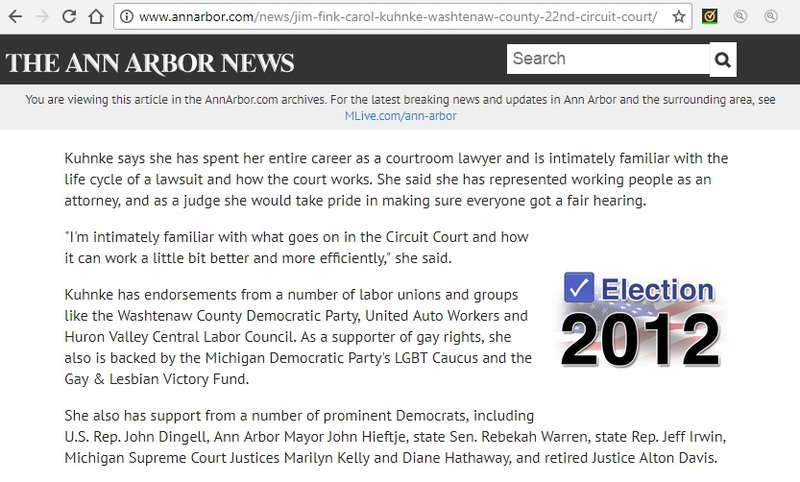 In year 2012, candidate Kuhnke campaigned with the babbling that she has "represented working people as an attorney, and as a judge she would take pride in making sure everyone got a fair hearing". "The State loves insurance companies and it loves employers and it loves oil companies and it loves anybody who's powerful. Okay? And it doesn't say that anywhere in our Constitution. But if you're not in those groups, the[n] you just kind of have to try and stay away --stay out of the way." Carol Kuhnke's blatant departure from the equal protection of the laws epitomizes her monumental hypocrisy as candidate. While never a bright person, Carol Kuhnke surely knows that expressing her actual mindset during campaign would have placed her at the lowest position in the 2012 primary election. In an era where courts all over the country are telling President Donald Trump that he is not above the law, Carol Kuhnke's debauched rule of thumb is appalling. Who would have imagined that charlatan Kuhnke has more in common with President Trump than with the Ann Arbor Democrats before whom she pandered for votes in the 2012 campaign? Later on, at that same hearing, I asked this judge how the defendant employer was going to clarify his wrongful statements of fact. 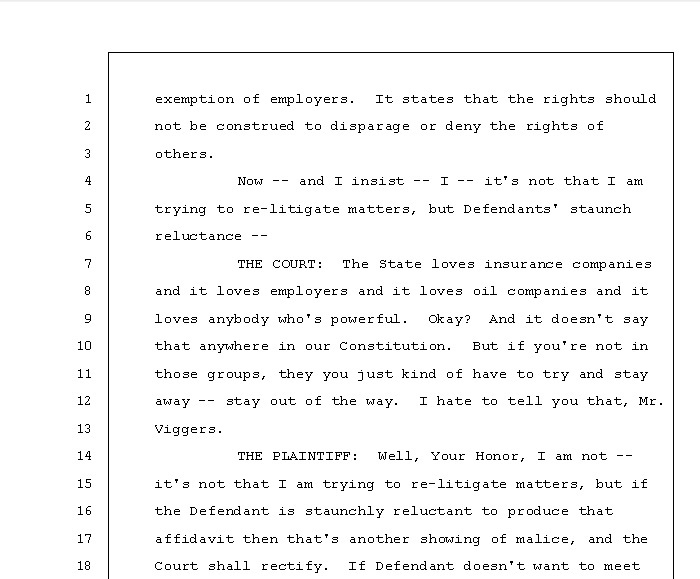 The question is important because (1) the defendant refuses to retract his disproved statements of fact; (2) judge Kuhnke stated minutes earlier "I can make someone swear to tell the truth" (page 18 of the transcript); and (3) the ascertainment of the truth is actually at the core of a judge's obligations. 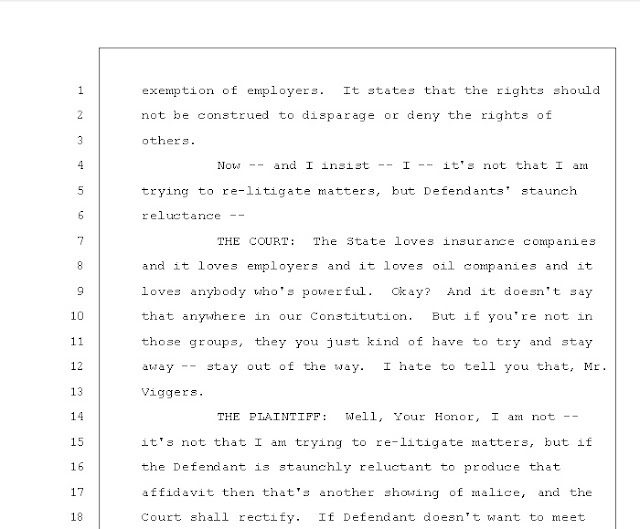 But judge Kuhnke answered my question with "That's not up to me" and "It's not up to me" (pages 24-25 of the transcript). Simply put, Carol Kuhnke's advanced erraticism and moral decomposition impede her to hold judicial office. What personality will Carol Kuhnke adopt this time as incumbent? She cannot have it both ways. Clearly she will have to pick one personality or the other. Will she paraphrase her fraudulent promise about the working electorate? Or will she cut to the chase and promise "anybody who's powerful" that she will lecture the rest of us "to stay out of the way"? Once ousted, it will be interesting to see whether attorney Carol Kuhnke will tell future her working clients what she in her capacity as corrupt judge has stated so blatantly. Social networks are a platform where some people boast of something they are not; maybe it gives them a sense of self-accomplishment, maybe it's delusion. 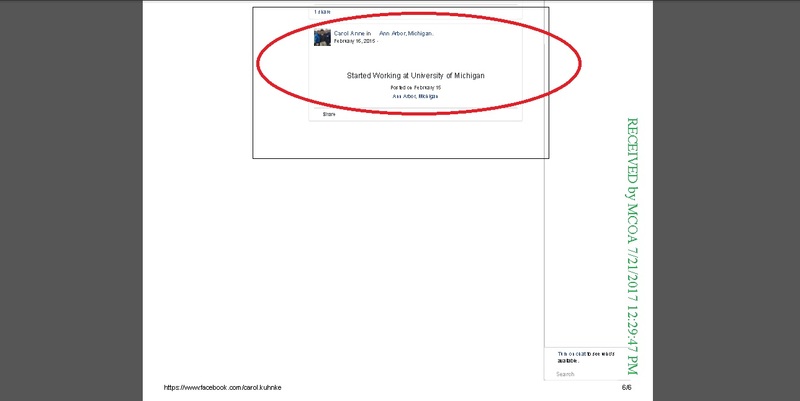 But one of those people is Carol Kuhnke, who used to post on her Facebook profile the false allegation that she works at the University of Michigan since 2015. 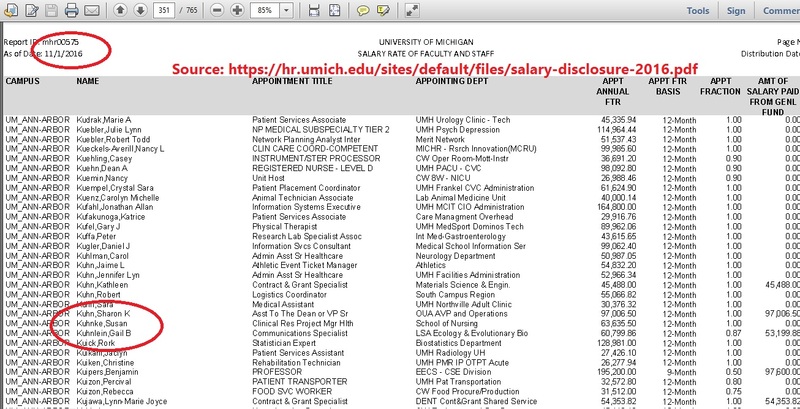 Looking at the University's annual lists of employees for years 2015, 2016, and 2017 suffices to disprove Carol Kuhnke's delusion. 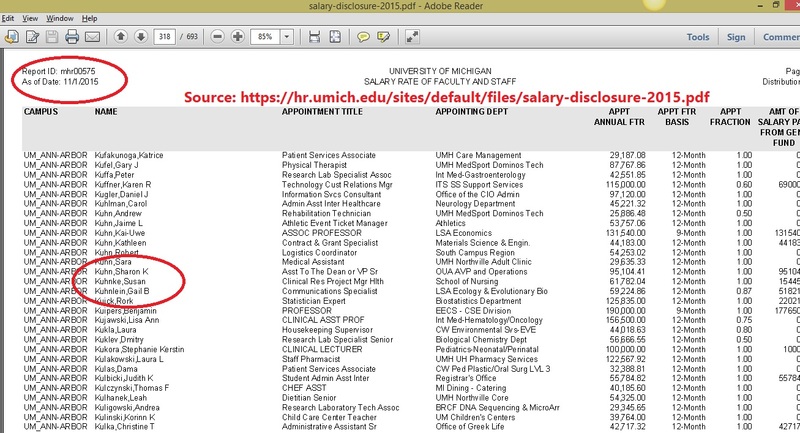 Granted, there is at least one judge who works at the University of Michigan, whose salary at the University for his 11% part-time is greater than the salary of many full-time employees at the University, and who fails to disqualify himself from cases where their employer the University of Michigan is a party. That judge is Timothy Connors, another decadent and inept judge in the Washtenaw County Trial Court and incumbent in the upcoming election. There might be other judges who supplement their judicial salary with some juicy income from the University in the form of part-time jobs, but Carol Kuhnke isn't one of them. 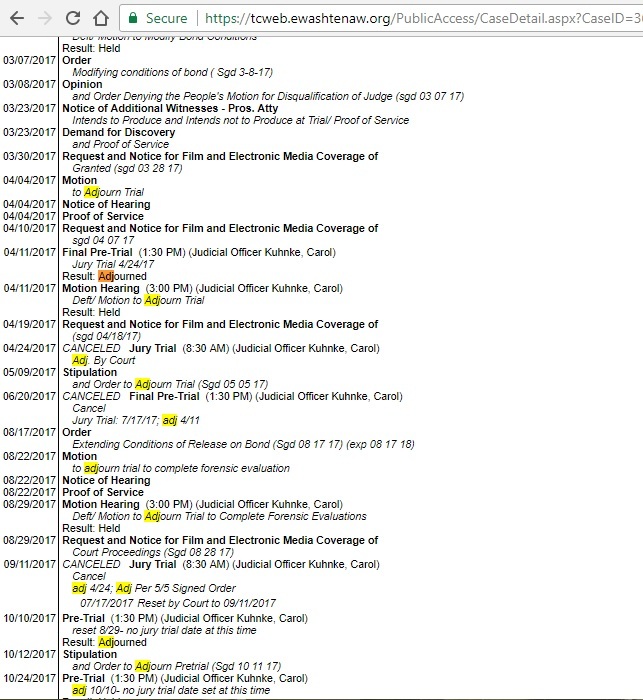 Interestingly, judge Kuhnke amended her Facebook profile soon after I pointed to that oddity in a motion (item 57) I filed in the Michigan Court Of Appeals in year 2017. 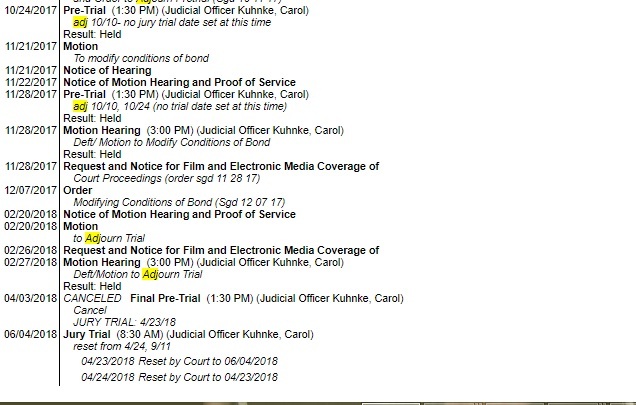 It is uncertain whether anybody advised judge Kuhnke to delete anything about her imaginary employment, or whether she realized that a delusion of that sort looks quite unbecoming of a judge, or whether on this matter Carol Kuhnke decided to stick to one of her multiple personalities. It is worrisome that a judge tasked with fact-finding shows signs of delusion about her an imaginary employer. 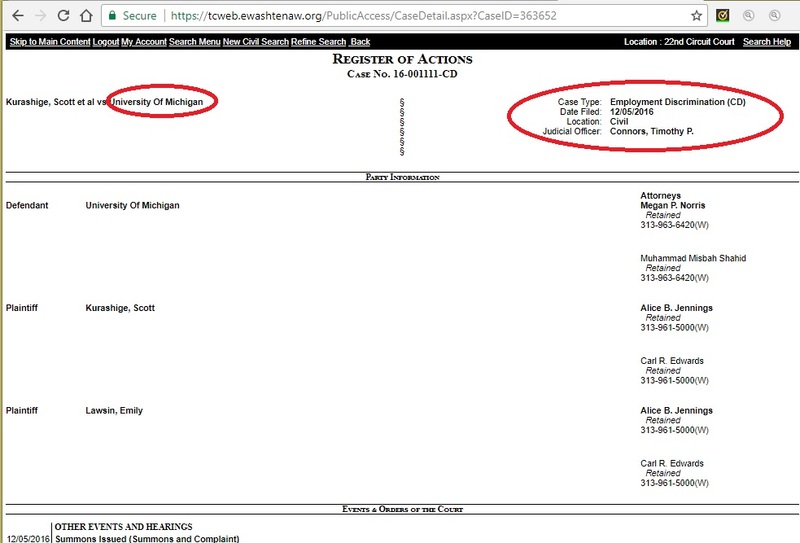 Moreover, this helps explaining why judge Kuhnke refused to address the avoidance and multiple inconsistencies that managers/directors from the University incurred during the depositions in 15-799-CZ and 15-1193-CZ: she just didn't want to get in trouble in her imaginary job. It is not always true that the "reviewing" court will reverse erroneous rulings from a lower court. Both Michigan appellate and supreme courts rubber-stamping of unreasonable rulings. In my experience, the appellate panel even resorted to making fraudulent statements for the sake of filling the blanks from Carol Kuhnke's inept rulings. That increases the importance of removing people like Carol Kuhnke from judicial office. As a defrauded litigant, it is outrageous that my cases were presided -and systematically sabotaged- by a crook who should be prosecuted for illegal possession of narcotics and maybe also for reckless endangerment of a child. But this is not an exhaustive list of Carol Kuhnke's misconduct and devotion toward "anybody who's powerful". Other reports about her suspicious leniency in multiple cases have caused public indignation. Not every attorneys eligible for judicial office commits drug-related crimes, and the fact that Carol Kuhnke hasn't been prosecuted does not make her any "honorable". However, it remains uncertain whether anybody will challenge this incumbent plagued with irregularities and nefarious conduct. While someone could aid Carol Kuhnke by creating a false appearance of contending for the spot, the truth is that a serious candidate has a great chance to replace this failed judge. In the meantime, the most important question is: How many additional cases will this felon preside?